The Outer Banks (OBX) region of North Carolina (the remote barrier island portions of Currituck, Dare, Hyde, and Carteret counties) has long been an important tourism destination, drawing visitors to its sand and sea activities. For example, Dare County had the fourth highest tourism expenditures in North Carolina in 2016 at $1,101,600,000 (U.S. Travel Association, 2016), demonstrating the value of natural resources to the OBX tourism economy. Only three predominantly urban counties in North Carolina have greater tourism expenditures: Mecklenburg, Guilford, and Wake. The natural resources that draw visitors to the OBX—predominately the beach ecosystem—are jeopardized by coastal hazards, including hurricanes, northeasters, and sea level rise, which are predicted to intensify from climate change (Kopp et al., 2015). The constantly shifting sands on the 200-mile narrow chain of islands change dramatically after storm-related flooding as new channels through the islands are formed and beaches are eroded (Riggs et al., 2011; Smith et al., 2008). Coastal hazards can impact the OBX tourism industry by disrupting transportation flows because of closed roads and bridges and canceled ferry service, by changing the visual quality of the beaches and the width of beaches, and by destroying infrastructure (hotels, vacation homes, restaurants, piers). Beach nourishment has become a common tool to protect oceanfront property and the visual appeal of the beach itself (Phillips and Jones, 2006). Beach nourishment projects add sand that is dredged offshore and pumped onto a beach to increase width. These projects temporarily close beach access. Dare County has a Beach Nourishment Fund that is generated by a 2% occupancy tax on hotel and motel rooms, vacation rental houses, and campsites. Additionally, the NC Department of Transportation is currently building a new 2.4-mile Bonner Bridge (construction began in 2016) to maintain access to Hatteras Island from Pea Island. A second phase of the project will implement permanent solutions for NC Highway 12 in Pea Island and Rodanthe, where the highway was breached due to Hurricane Irene storm surges and erosion in 2011. Adding sand back to beaches and building better transportation corridors may help sustain tourism to the OBX. Despite these efforts, coastal hazards will continue to create disruptions that may lead visitors to change their OBX vacation plans and travel elsewhere. To better understand how tourism may change due to coastal hazards, we conducted survey research with a sample of OBX visitors during the summer of 2016. We were interested in understanding if and how potential storm-related damage would change these visitors’ vacation plans. Additionally, we wanted to know the specific types of amenities desired by visitors if tourism development were to occur in the adjacent Inner Banks (IBX) region of North Carolina (Figure 1). We selected the IBX as an alternative location because this predominately rural region currently does not have a large tourism tax base. For example, OBX tourism provided each Dare County resident with roughly $2,800 in personal tax savings in 2016, whereas IBX tourism provided each Tyrrell County resident with about $122 in personal tax savings in the same year (Visit North Carolina, 2018). Should OBX tourism be impacted by coastal hazards, the IBX scenario represents an option that retains tourism dollars in North Carolina and promotes tourism development in a region with declining traditional economies (such as farming, fishing, and forestry) but rich with nature-based tourism opportunities, including kayaking, bird-watching, and wildlife viewing. Figure 1. The Outer Banks (blue) and Inner Banks (green) of North Carolina. What are the recreational preferences of OBX visitors? How will OBX visitors respond to coastal hazards? How important are specific tourism amenities to future IBX trips? We conclude by summarizing the implications of this study for the future of North Carolina’s coastal tourism. A team of researchers from NC State University’s Department of Parks, Recreation and Tourism Management intercepted OBX visitors at four locations: the Tyrrell County Visitor Center, the Alligator River National Wildlife Refuge Visitor Center in Manteo, the Pea Island National Wildlife Refuge Visitor Center on Pea Island, and the Swan Quarter-Ocracoke Ferry. Sampling dates and time blocks were randomly selected during the 2016 summer season. Visitors were asked to voluntarily participate in the study, with an incentive of possibly receiving one of five $50 gift cards. If visitors agreed to participate, they completed the questionnaire on a tablet computer using Qualtrics Offline Survey App software. Those who completed the questionnaire are referred to in this report as the respondents. Respondents were shown a map that illustrated the OBX and IBX regions (Figure 1). Additionally, each respondent was shown one of four scenarios describing possible future conditions. Each of the four scenarios included a set of conditions that involved transportation closures, increases in occupancy taxes, likelihood of beach nourishment project occurring at destination, and decreases in beach width (Table 1). Each scenario was randomly selected by the Qualtrics Offline Survey App software. For example, one scenario may have specified a 50% likelihood of a beach nourishment project occurring at destination, NC Highway 12 being closed at the Oregon Inlet, 150 feet of beach width, and a 5% increase in occupancy taxes for additional beach nourishment projects. After reviewing these scenarios, respondents were asked to indicate how the potential conditions would influence their vacation plans to the OBX. Respondents were also asked to report their likelihood of visiting other destinations if they could not reach the OBX due to impacts from coastal hazards (their substitution behaviors). Other questionnaire items captured respondents’ planned activities and destinations, trip characteristics, place connections, and demographic information. Data were downloaded and cleaned following standard procedures before uploading into SPSS v.24 software for analysis. Table 1. Examples of hypothetical future conditions presented to survey respondents. Of the 463 visitors invited to participate in the study, 382 completed the survey (83% response rate). Only a few visitors were sampled at the Tyrrell County Visitor Center (4%), as most tourists were stopping only for a bathroom break and did not enter the Visitor Center (where permission was granted to intercept visitors). All other visitors were intercepted at the North Carolina Wildlife Refuges Visitor Center in Manteo (36%), on the Swan Quarter-Ocracoke Ferry (34%), and at Pea Island National Wildlife Refuge (26%). Nonresponse bias was accounted for by asking the 60 visitors who declined participation to answer five questions on their trip characteristics, climate change perceptions, home ZIP code, and age. The respondents also answered the same five questions. No significant differences were found between responses of the nonparticipating visitors and the respondents who completed the full survey. 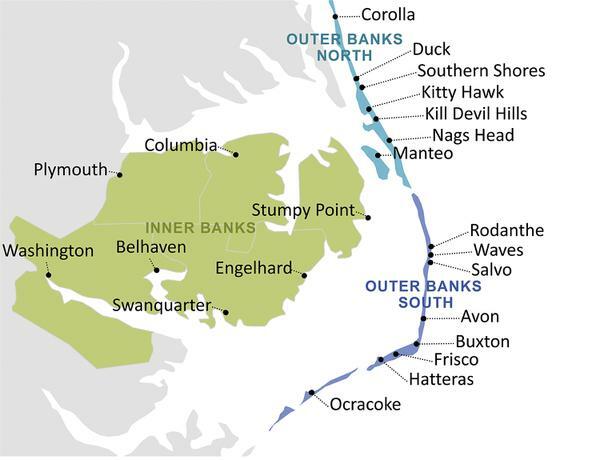 This suggests that findings are representative of OBX visitors who travel on the Swan Quarter-Ocracoke Ferry and visit the National Wildlife Refuge Visitor Centers located in Manteo and on Pea Island. Results may not be generalizable to other OBX tourists who use different access points and those who may not be interested in learning about the region’s wildlife, habitat, or outdoor recreational activities (the typical interests of visitors to national wildlife refuge visitor centers). Most respondents were not North Carolina residents (76% out-of-state, 21% in-state, 3% international). Slightly more respondents were female (51%); a few respondents preferred not to report their gender (3%). The average age of respondents was 46, with a range of ages from 18 (<1%) to 88 (<1%). About one-third of respondents reported an annual household income of over $100,000 (36%); however, many respondents preferred not to report their income (18%). Most respondents reported having a college degree as the highest degree received (9% associate’s, 33% bachelor’s, 24% master’s, 7% doctorate). Additionally, respondents reported diverse political ideologies, with 17% reporting as conservative, 14% moderate-conservative, 15% moderate, 13% moderate-liberal, and 18% liberal (24% preferred not to say). 44% of survey respondents have previously visited the IBX as part of a vacation or recreational trip. Most respondents reported that the primary purpose of their trip was to vacation or recreate in the OBX (88%). Relatively few respondents reported that their primary trip purpose was to vacation or recreate in the IBX (3%) or in both the IBX and OBX (4%). However, nearly one-half of visitors reported previously visiting the IBX as part of a vacation or recreational trip (44%). Relatively few respondents reported that they were traveling through the area to another destination (5%). 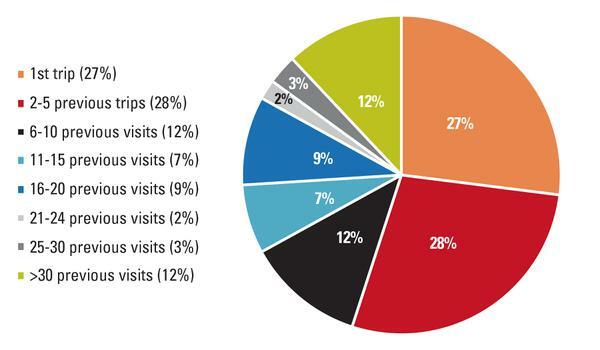 Respondents’ visitation history to the OBX was diverse, with the majority indicating it was their first time visiting (27%) or that they had made two to five previous visits (28%) (Figure 2). While most respondents had never visited the IBX as part of a vacation or recreational trip (56%), one-half reported being aware of IBX recreation or tourism opportunities (50%). We also asked respondents about their place connections to the OBX. More than one-half of respondents agreed that they were very attached to the OBX (57%) and identified strongly with the OBX (53%) (Figure 3). More than one-half of respondents also agreed that the OBX region is a special place for their families (65%), many important family memories are tied to the OBX (61%), and that no other place compares to the OBX (54%). It is important to note that most respondents who didn’t agree with these questionnaire items reported neutral opinions (that is, not many disagreed with the statements). Ocracoke was the most popular primary destination for tourists (29%) followed by Nags Head (17%), Kill Devil Hills (12%), Manteo (8%), and Kitty Hawk (6%) (Figure 4). The predominance of Ocracoke as the primary destination could be attributed to sampling on the Swan Quarter-Ocracoke Ferry. Only nine respondents indicated that the closest town to their primary destination was on the IBX. 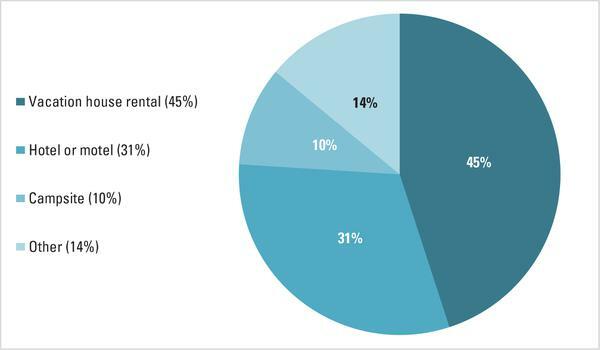 The most common type of accommodation was vacation home rentals (45%), followed by hotels or motels (31%) and campsites (10%) (Figure 5). Some respondents reported “other” accommodations (14%), and described their accommodation as an Airbnb rental, condominium, townhouse, timeshare, their own vacation home, a friend’s house, or a boat. The average length of stay was five to six nights, with a range from a one-day trip (3%) to more than two weeks (4%). Respondents typically reported planning their trip two to five months in advance (34%) or a minimum of six months in advance (35%), but the trip planning durations ranged from day-of planning (2%) to advance planning of more than one year (5%). Most survey respondents were seeking “sun & sand” activities during their OBX vacations. Most respondents planned to visit state or federal lands during their trip (85%), with more than one-half of respondents reporting that they planned to visit Cape Hatteras National Seashore (53%). 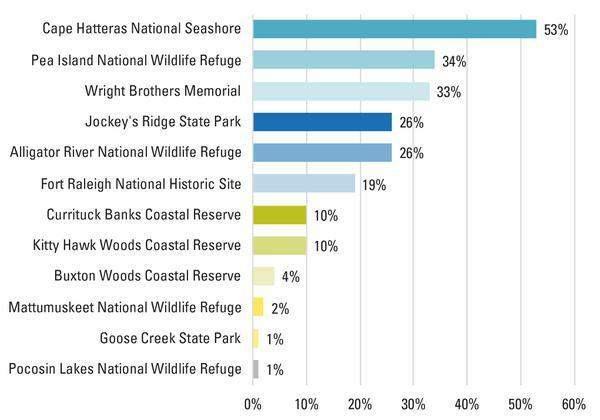 Other sites that respondents planned to visit included Pea Island National Wildlife Refuge (34%) and the Wright Memorial (33%) (Figure 6). Respondents most frequently engaged in beach-related activities on the OBX (such as ocean swimming, sunbathing, and shell collecting) (Figure 7). Nearly all respondents indicated that they were aware of recreation and tourism activities in the IBX (99%), with wildlife viewing (40%), fishing (37%), bird-watching (36%), kayaking (36%), and canoeing (31%) being the most common activities of which these visitors were aware (Figure 8). A few respondents, however, indicated that they planned to engage in outdoor recreation activities in the IBX (3% bird-watching, 3% motorized boating, 2% fishing, 2% canoeing, 1% kayaking, and 1% wildlife viewing). Will OBX visitors respond to coastal hazards? Most survey respondents were aware of climate change and perceived the North Carolina coast to be threatened by climate change impacts. To understand how visitors might respond to coastal hazards, we must first understand respondents’ climate change perceptions. In general, respondents were aware of and concerned about climate change and its impacts on coastal North Carolina. 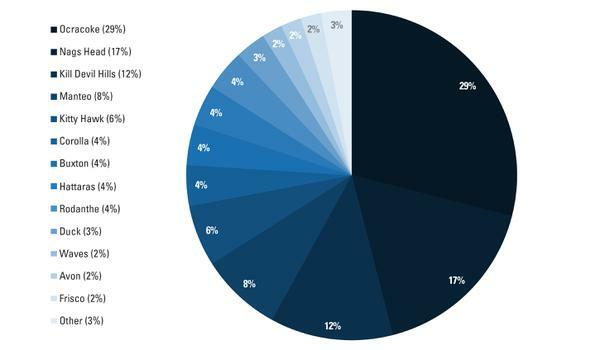 Most respondents agreed that climate change is happening (74%) and that it is caused by humans (56%) (Figure 9). Most respondents also indicated that they were concerned with global climate change (65%), coastal flooding (65%), and sea level rise (65%). Additionally, most respondents agreed that sea level rise is a threat to North Carolina (68%), and that the OBX is vulnerable to sea level rise (78%) and coastal flooding (75%). 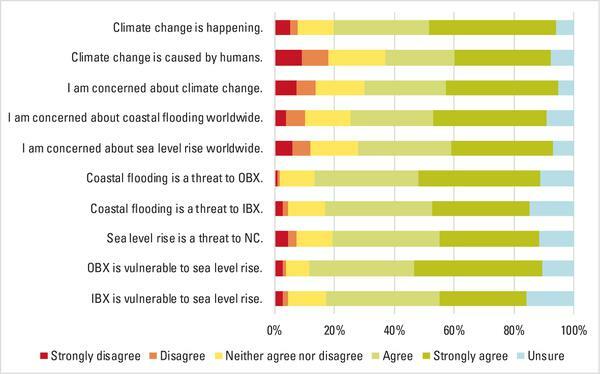 Respondents also agreed that the IBX is also vulnerable to sea level rise (67%) and coastal flooding (68%). 55% of survey respondents were not likely to cancel their OBX trip due to potential impacts from coastal hazards. After respondents were presented with the potential future conditions (scenarios) in the OBX, they were asked how likely they would be to cancel their trip to the OBX entirely. Few respondents indicated that they would be likely (10%) or extremely likely (3%) to cancel their trip entirely. More than one-half of respondents indicated that they were either unlikely (38%) or extremely unlikely (17%) to cancel their trip entirely. About one-third of respondents were undecided as to how they would respond to the potential impacts from coastal hazards (32%). Respondents were also asked what they would do if they could not visit the OBX for a typical vacation due to any form of storm-related damage. The most likely options reported by respondents were to put their plans on hold (37%), to go to another beach within North Carolina (41%), or to go to another beach outside of North Carolina (48%) (Figure 10). The most unlikely options reported by visitors were to stay in the IBX (49%) or to stop visiting the OBX altogether (80%). 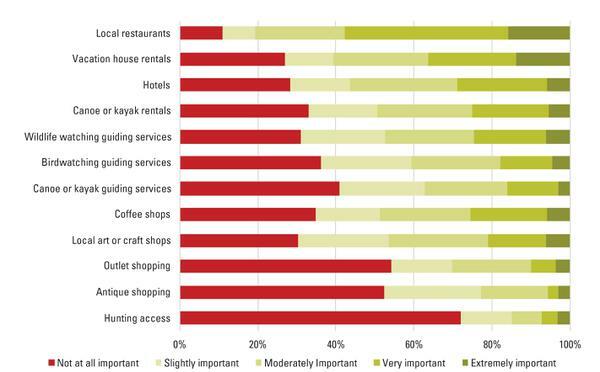 We asked respondents to indicate the importance of specific tourism amenities for future trips to the IBX (Figure 11). Key amenities included local restaurants, vacation house rentals, and hotels; however, these amenities were, on average, only considered to be of moderate importance. Other amenities that respondents viewed as being at least slightly important included those that would enable outdoor recreation, except for hunting access. Only 15% of respondents thought hunting access was moderately, very, or extremely important. In terms of shopping, coffee shops and local arts and crafts shops were perceived to be at least of moderate importance by about one-half of respondents. Approximately one-half of respondents perceived antique shops and outlet shops to be not at all important. Figure 2. Visitation history to the OBX (% of respondents). Figure 3. Level of agreement with statements about place connections to the OBX (% of respondents). Figure 4. Closest town to primary destination (% of respondents). Figure 5. Types of accommodations (% of respondents). Figure 6. Planning to visit specific state or federal lands (% of respondents). Figure 7. Participation in specific activities on the OBX (% of respondents). Figure 8. 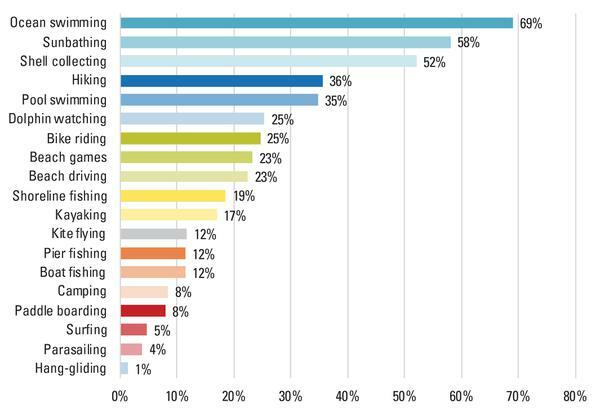 Awareness of specific recreational activities in the IBX (% of respondents). Figure 9. Level of agreement with statements about climate change (% of respondents). Figure 10. Likelihood of travel behaviors if the OBX could not be reached due to impacts from coastal hazards (% of respondents). Figure 11. 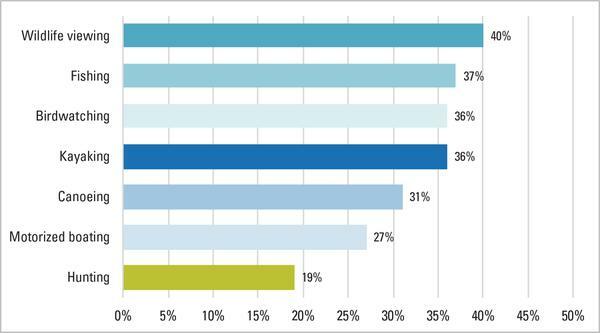 Perceptions of the importance of specific tourism amenities to potential future IBX visits (% of respondents). We conducted this study to better understand how OBX tourism may change given coastal hazards. We surveyed 382 OBX visitors during the summer of 2016 to understand if and how potential coastal hazards would change these visitors’ vacation plans. Possible road closures, increasing occupancy taxes to pay for beach nourishment projects, the presence of beach nourishment projects, and beach width were presented to the respondents as possible future conditions. Additionally, we specifically wanted to know the types of amenities potential visitors desired, should tourism development occur in the adjacent IBX region. This study highlights key implications of coastal hazards for the OBX tourism industry. Based on survey responses, OBX visitors are seeking traditional “sun and sand” activities associated with beach tourism but are also interested in nature-based recreational opportunities available in the region’s ample federally and state protected lands. Moreover, our study suggests that OBX visitors form deep connections with the region. Such sentiments may explain why relatively few respondents indicated they would cancel a planned trip if the OBX was dealing with impacts from coastal hazards, even though respondents typically felt that climate change impacts (including coastal flooding and sea level rise) threaten the region. Although this finding suggests some stability in the OBX tourism industry, it also means that significant and continual investments in infrastructure (such as bridges, roads, dunes, beaches, piers) and disaster recovery efforts (including beach nourishments or rebuilding of vacation homes, hotels, and motels) will be necessary to meet visitation demand. Yet, development on barrier islands also increases the vulnerability of islands to impacts from coastal hazards. Additionally, more extensive infrastructure can increase the cost of recovery from possible damages to property. Therefore, a critical first-step for anyone interested in entering the OBX tourism industry, as well as those responsible for managing tourism in the future, would be to gain a thorough understanding of current regulations of federal or state disaster recovery assistance programs. The IBX tourism industry could benefit from a market analysis and increasing marketing efforts of current tourism offerings and accommodations. OBX visitors form deep connections with the region. Disruptions from disasters may result in substantial OBX tourism declines. Significant and continual investments in infrastructure and disaster recovery efforts will be necessary to meet visitation demand. Tourism entrepreneurs need a thorough understanding of current regulations of federal and state disaster recovery assistance programs. Although most respondents reported being unlikely to cancel their vacation given the potential coastal hazards our survey posed, nearly one-third reported that they were undecided if they would cancel their visit given potential coastal hazards. Such indecision indicates substantial uncertainty for the OBX tourism industry. Given the history of coastal hazards on the OBX and the likelihood that storms will become more severe and possibly more frequent, continual long-term planning efforts are needed, such as the 2015 efforts of North Carolina Sea Grant with the town of Nags Head (Whitehead and White, 2017). If unable to visit the region because of impacts from coastal hazard, respondents reported that they would be most likely to visit another beach, either within or outside of North Carolina. This study finding reinforces that most OBX visitors are typical “sun and sand” beach tourists. Tourism planners in the IBX should consider the real possibility that OBX visitors simply might not be willing to replace a beach vacation with nature-based opportunities available within the IBX. In other words, the nature-based recreation opportunities (such as fishing, wildlife viewing, kayaking, canoeing) found within the IBX do not align with the motivations of the majority of OBX visitors (that is, beach vacation activities). Yet, 20% of respondents indicated that they would be likely or extremely likely to visit the IBX, which suggests that at least some OBX visitors seek nature-based recreational activities in addition to “sun and sand” activities. Thus, some investment in an IBX tourism economy seems warranted so long as that investment corresponds with more intensive marketing of IBX tourism activities. The IBX tourism industry could benefit from a market analysis followed by increased marketing efforts that focus on current tourism offerings and accommodations, as less than one-half of the survey respondents were aware of any one specific activity available within the IBX. This tourism development potential for the IBX presents opportunities, particularly for individuals interested in managing vacation home properties and opening local restaurants. Investment priorities should also focus on hotels, canoe and kayak rentals, wildlife watching guiding services, coffee shops, and local arts and crafts shops. Again, individuals interested in investing in tourism development need to be aware of current regulations for developing in flood zones and for federal and state disaster recovery assistance, as the IBX region is also threatened by storm-related flooding and sea level rise. It will be important for the OBX and IBX tourism industries to continue coastal hazards planning efforts and to update current plans as the land changes in response to storm-related flooding and sea level rise. Individuals interested in entrepreneurial tourism development opportunities should familiarize themselves with the National Flood Insurance Program and other federal and state disaster recovery assistance programs. This study will need to be replicated immediately after impacts from coastal hazards occur and as conditions gradually change to determine post-disaster and long-term climate-related impacts (such as sea level rise) to the OBX tourism economy. The continued assessment of changes in OBX tourism is needed as the potential loss of tourism revenue for North Carolina could be substantial. One near-term, proactive strategy to reduce negative impacts to the state’s tourism economy from coastal hazards would be to develop a rapid-response communication plan (hosted on multiple website and social media platforms) that provides suggestions for other vacation destinations in the state that are not experiencing coastal hazard impacts. By using the findings from this study and ongoing assessments, OBX and IBX tourism providers will be better prepared to sustain coastal tourism. Kopp, R. E., B. P. Horton, A. C. Kemp, and C. Tebaldi. 2015. Past and future sea-level rise along the coast of North Carolina, USA. Climatic Change, 132(4), 693–707. https://doi.org/10.1007/s10584-015-1451-x. Nicholls, R. J., and A. Cazenave. 2010. Sea-level rise and its impact on coastal zones. Science, 328(5985), 1517–1520. https://doi.org/10.1126/science.1185782. Phillips, M. R., and A. L. Jones. 2006. Erosion and tourism infrastructure in the coastal zone: Problems, consequences and management. Tourism Management, 27(3), 517–524. https://doi.org/10.1016/j.tourman.2005.10.019. Riggs, S., D. Ames, S. Culver, and D. Mallinson. 2011. The battle for North Carolina’s coast: Evolutionary history, present crisis, and vision for the future. Chapel Hill, NC: University of North Carolina Press. Smith, C. G., S. J. Culver, S. R. Riggs, D. Ames, D. R. Corbett, and D. Mallinson. 2008. Geospatial analysis of barrier island width of two segments of the Outer Banks, North Carolina, USA: Anthropogenic curtailment of natural self-sustaining processes. Journal of Coastal Research, 70–83. U.S. Travel Association. 2017. The Economic Impact of Travel on North Carolina Counties. A study prepared for Visit North Carolina. Washington, DC: U.S. Travel Association. https://partners.visitnc.com/contents/sdownload/67490/file/2016-Economic-Impact-of-Travel-on-North-Carolina-Counties-revised.pdf. Visit North Carolina. 2018, March 18 (accessed). Economic Impact Studies webpage. Cary, NC: Economic Development Partnership of North Carolina. https://partners.visitnc.com/economic-impact-studies. Whitehead, J., and H. White. 2017. Adaptation Planning in the Town of Nags Head: Vulnerability, Consequences, Adaptation, Planning Scenarios (VCAPS) Report. Nags Head, NC: Town of Nags Head. http://www.nagsheadnc.gov/index.asp?SEC=DE1CD710-2817-4464-8AA3-7B25D5B8AEA9&Type=B_BASIC. We would like to thank the respondents who voluntarily agreed to participate in this study. We would also like to thank the two peer reviewers for their valuable feedback. Funding for this project was provided by the College of Natural Resources at NC State University as part of a strategic initiative to build interdisciplinary strengths.